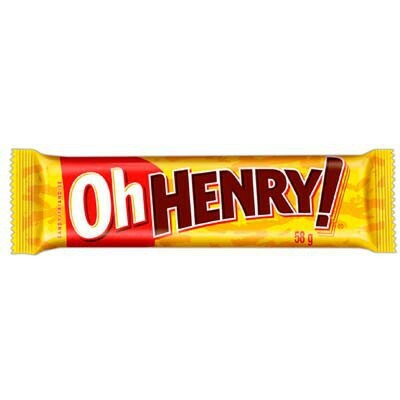 A popular American chocolate bar, OH HENRY! 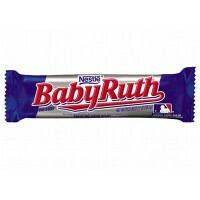 was named after a boy who used to come into the Williamson Candy Company factory to flirt with the girls making candy. Every time the girls needed to have something done, they would call "Oh Henry!". OH HENRY! 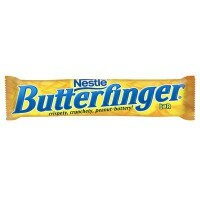 candy bars combine big crunchy peanuts and creamy caramel with chewy fudge...all covered with a rich chocolaty coating. If you like peanuts, you'll LOVE Oh Henry! 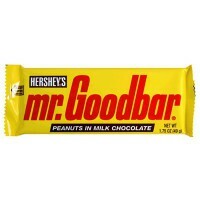 Milk chocolate (sugar, cocoa butter, chocolate, nonfat milk, milk fat, lactose [milk], emulsifier E322 [soy lecithin], natural flavor), corn syrup, roasted peanuts, sugar, nonfat milk, coconut oil, less than 2% of: salt, emulsifier E471, egg whites, modified soy protein, antioxidant E319 (to preserve freshness), acidity regulator E330. Contains GMO. Nutrition facts (for 100g): calories 471Kcal, total fat 21.6g (saturated fat 9.8g), total carbohydrate 62.7g (sugar 43.1g), protein 5.9g, salt 0.4g. Bon goût (comme les snickers) mais le tout est ultra condensé et difficile à manger. 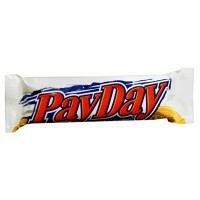 Sembra di mangiare uno snickers.